We’re back with more of a Finance 101-style topic this week, so don’t expect anything too revolutionary or mind-blowing. Just a lone 20-year old rambling about certain Magic: The Gathering cards that I believe will go up, down, or remain stagnant as bulk rares for the rest of their miserable existences. Well, I guess that’s not entirely true. I do kind of have a theme here. I want to wedge in a little bit of discussion about the best ways to out your prerelease bananas. We all know what happens next. I’m very guilty of it myself. We go home, let that Champion sit in our binder for the next two FNMs, but nobody points it out as a trade target. Suddenly the card is only worth $3, and we buylist it for $1 because we’re sick of looking at it, and you know it will never see Constructed play. You only got like one slice of that delicious banana bread out of that deal, when you could have been fast enough to trade off that ripe banana for some apples or carrots. Those don’t go bad quickly, right? I don’t know. I’m not Gordon Ramsay over here. 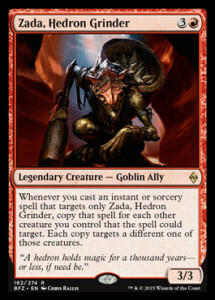 That Zada, Hedron Grinder (which is one of the more stupid names that I’ve heard for a card in a while) is pre-selling for $2 now, but you and I both know that it’ll be a bulk rares in about two weeks. If you didn’t know that the legendary hedron grinder (ugh) will be a bulk rare, then consider it something you’ve learned from this article. So how do you get rid of stuff like that? Ob Nixilis Reignited is preselling for $15 on eBay (which is one of the lowest prices we’ve seen for a planeswalker preorder in a long time), but you won’t be able to set him free on TCGplayer until the set’s official release date. Selling on eBay yourself is an option, but the fees are too high for my personal tastes, and the customer service is weighted heavily against you as a seller. There will also be a large number of people at your FNM who read articles like mine, telling them to stay away from your precious Ob Nixilis like it’s the plague, until it’s a paltry $7. If you really want to move that demon buddy now, then I’ve got a couple of suggestions that you may want to pocket. Facebook is one of the best way to move new cards. Actually, I’m coming to a realization that I mention this in pretty much every damn article I write. And you know what? I haven’t been convinced that I’m wrong yet, so I’ll keep saying it. I wrote in detail here about selling a picked-through collection via Facebook, but I want to emphasize this here: most non-competitive players don’t go to your LGS. They’re not sitting across from you at FNM, or scanning through the spoilers every single day like we are. They don’t have eighteen different sources of price-tracking info coming into their brains, but most of them will have a Facebook page. Most of those non-competitive-but-on-social-media players most will have liked a Magic: The Gathering page at some point in time of their social-media lives. If that page allows the buying, selling, and trading of cards, this is where you want to be. You want to ride just under the prices they’re seeing on eBay and TCGplayer, because these are the impulse buyers of Magic. They want their sweet new cards, and they want them as soon as possible. Timmy Incarnate behind his computer screen has been waiting to add that Desolation Twin to his Eldrazi deck for weeks now, and you’re going to help make it happen. How much is it going to cost Timmy? $2? That’s it? Bam. Easy. And it saved you from sullenly sliding that Twin into your bulk rare box a month from now. Everyone’s happy. Sell those $12 copies of Ob Nixilis, $13 Kioras, and ride that prerelease hype wave as far as you can surf, until those 8/8 octopuses turn all of your hard-pulled cards into gross little bulk rares. Alternatively, you can test how fast your fingers can click and try your hand at PucaTrading those new treasures away. Trader be wary though: everyone is going to be looking at the same target here. If you thought Standard cards were difficult to move on PucaTrade as just an average Joe user, you’ll be disappointed to learn that cards straight out of the new set are on another level. Everyone wants to get that sweet, uncut value. I mean, there aren’t any actual trap cards, like Archive Trap and whatnot, but I do believe there are a couple of other trap cards from Origins that I believe I’m in minority of rallying against. Everyone is up in arms about these two tricks of Nissa’s being near-guaranteed landfall spec targets, but I’m not seeing it. Both of these cards are hovering around the $3 point right now, and they’ve each crept up to that point relatively recently. I don’t think you want to pay four total mana to play and equip Sword of the Animist just to get a landfall trigger every turn, especially when your guy could just get bolted in response. If we’re equipping a creature and attacking with it, I want to win the game very soon after. I just don’t feel like Sword of the Animist has the power level to do that. Even if it does see play in a Standard list, how many do you play? Probably two at most—I can’t see you wanting three copies. You’ll draw too many at that point. So do you expect this to go to $6 or $7 in a set where there’s already a $20 non-mythic holding up a substantial portion of the set’s value? I’m just not buying it. Literally. I’m not buying this card, unless I get it at buylist prices. As for Animist’s Awakening, I feel like it’s way too much of a gamble to be investing that much mana into crossing your fingers and hoping for more ramp. If you’re trying to abuse this with Omnath, you should be able to end the game off of two or three more landfall triggers, fueled by fetch lands and maybe a single ramp spell, not casting this for seven or eight mana and hoping that you have 50 power on board. While I play it (and absolutely love it) in my Child of Alara EDH deck, that’s a completely different environment, and I can’t see this being run as a four-of in any particular landfall deck. It sees $3 off of two things: hype for the new set and mechanic, and people like me who jam it in EDH. If you’re holding onto either of these cards at $3 and hoping they jump, my recommendation is to sell off now into that hype. Did you know Hardened Scales is a $2 Magic card? I mean, I knew it was pretty good in EDH, but I didn’t think it would be more expensive than a Prophet of Kruphix. I’m pretty sure I have several copies of Scales in my bulk-rare boxes right now; or at least, I’m pretty sure I used to. Some smart reader out there probably realized that the card was worth more than I was selling it for, and pulled it out to make money off of me. Good for you, if you did that. Dragon Whisperer is the same price as Hardened Scales. Now, that can’t be right. I know my friend Travis has written about this card extensively, and put his money where his mouth is. I can’t say I blame him, and I’m tempted to dump a reasonable chunk of change to follow suit. There are a lot of abilities on this card, and it fits perfectly into the curve of the mono-red deck that we all know will exist post-rotation. Writing this paragraph and looking at this price graph is slowly convincing me, so you’ll probably see me in What We’re Buying and Selling This Week on Saturday with my pile of Whisperers that I bought for two freaking dollars each. Anyway, that’s all I’ve got for this week. I got a little bit side-tracked, but that’s alright. I didn’t have too solid of a topic anyway. Let’s talk about Magic cards in the comments below. You’re probably more likely to get a quick response if you use Twitter or Facebook, though. Fair warning. Have a great weekend, everyone! Do you think any of the BFZ rates will hold value? That depends on your definition of “value”. It will be very difficult for a non-land rare to hold $5 or above. If the new Hero’s Downfall sees play as a 3-4 of in at least two decks, I think it would stay around $6-7 for a short period of time, instead of Downfall’s $15. Do you really think a card as broken as Zada will be bulk? I totally expect him to be in Standard in either a Boros shell or in the Mono-R deck that needs to get one more big attack in. And if the reason is “But it can be removed! !”, you clearly aren’t playing much Magic (like with Sword of the Animist, but I don’t think this card is too good, either). I may be wrong, but in a Standard environment where we have Titan’s Strength, Defiant Strike and Temur Battle Rage (I think Chandra’s Ignition is not what we would want here) in addition to Horderling Outburst AND Dragon Fodder, this guy is a force to be reckoned with. But yes, it could be the other way around. I don’t see him as a spec target, but I will definitely play him and see what he can do. I am bullish as a person can possibly be on Zada. If it sees play in Standard, sure, it could get above bulk, but even though it’s stupid busted, the best way to take advantage of that is EDH and EDH can’t buoy non-foil copies. I don’t know if this is what goblins want to be doing, but if you have a few tokens, this turns a Titan’s Strength into a 1-shot. It’s certainly powerful, but it needs to get played in Standard to be worth anything, so that’s what we’re risking basically $1.90 of our $2 preorder price on. Those are rough odds. I really don’t think he’ll see play in Standard, he just seems too Magical Christmas Land-y to me. I could definitely be wrong, but I’m playing safe instead of aggressive on BFZ specs. The only preorder price I like so far is the new fat Ewitness at $5, and that’s only if you plan on playing with them in the first couple weeks. I’m not buying into Zada at $2 and crossing my fingers for $4-5. With both you and Jason on the other side of the bet I feel even more eager to place my money here 😉 No, but seriously, it is tough to predict the Standard-Meta after rotation. Usually fast aggressive decks emerge first and Mono-R has the tools. Goblin Rabblemaster and Eidolon of the Great Revel leave open slots and I can see Zada fill this. In the past I was totally wrong with Descent of the Dragon (now THIS was magical Christmas land MTG), but I was right on Jace and HBW and heed my words, they will both become even more important after rotation. On the last note: like I said on twitter (I’m @Tie-Germann), the pseudo-double E-Wit is expensive for the same effect Den Protector has while bringing DMR back. Ans to use StU as the reason that it will be good just shows how much people want that card to happen. Even if I may be totally wrong, this seems to be more of a gamble than Zada. First time I saw Hardened Scales I thought will WOTC make this a centerstone of a standard deck. 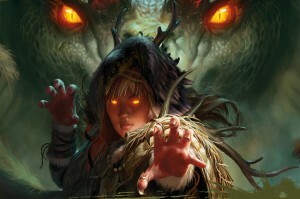 Undergrowth Champion and Managorger Hydra make it plausable that we will see a Hardened Scales type deck in standard. Will it have legs? Not sure, but Hardened Scales was under appreciated and it appears the other pieces of the deck are slowly showing up. I picked up 40 Hardened Scales at under .50 and am hopeful it will continue to slowly tick up to around 3.5-5. Time will tell.. If Sylvan Scrying is in the set as speculated today. You will be able to get a fetch, use it and place another land in play. Very helpful for Undergrowth Champion. I would suggest selling out of Scales at $2 if you bought in at $.50 and being happy with the 4x multiplier, but that’s just me. I really don’t think Undergrowth will see legs in Standard, I don’t want to have to play an additional enchantment just to make my Grey Ogre not garbage. I was happily shipping my Animist’s Awakening on puca about a month ago for 150 points because I was convinced it’s not constructed playable. I’m glad to see others agree! I don’t agree on the difficulty of pucatrade between prerelease and set release. The bulk of my pucatrading since M15 has been right after prerelease, the magical time when bulk commons/uncommons are worth the price of the stamp. 2-4 prereleases usually net around 4000 points, which isn’t a bad way to recoup some of the cost. The quantity of trades only increases with a page notifier (I use pucapower). It’s like pucatrade on easy mode, so long as you’re near your computer to hear the notifier. Trade standard trash for modern staples AND watch Netflix – what’s not to love? The puca wishlists are also a good indicator on “what’s good”. The 500 point Tasigurs were on EVERYONE’S want list after FRF. I was building a modern ramp deck at the time, so my prerelease foil at 1100 points financed a through the breach (the first was a deal, the second was the price at the time – no regrets whatsoever). My point is, if you find yourself with a constructed playable bomb, but are either more casual or want another deck, it’s relatively easy to send off your 1-2 prerelease copies. That’s interesting. I’ve had a lot less success trading on Pucatrade immediately after release, and even with a page notifier (granted I only used it for less than a day), I was often late to the trade by a couple of seconds. At this point, I usually buy points for .70 on the dollar and then fill orders for local customers who are willing to pay full TCG mid for me to order cards for them. And then people will be laughing all the way to the bank when their jace’s hit 40$ and their hangarbacks hit 20$. You seem to assume that every card in the expansion will tank, but history has shown that “experts” have a history of missing high value cards. Simply assuming that Ob nixilis will be 7$ is highly arrogant, especially when the card itself is as powerful as it is. You make a qualified guess and place your bets based on that guess, but someone else will be on different cards and they could easily turn out to be right instead. Instead of writing in a tone that seems to ridicule anyone who thinks differently than you, you should at least consider that there is a reason for why they think like that. That is how cards come out of nowhere to break formats. And for the record, ob nixilis will be a staple of standard as long as it is legal, and it is likely that it will keep a solid 15$ price tag, based on the expeditions effect. I am not pulling the trigger myself yet, but you will probably want to grab them whilst nonbelievers wait until prerelease to find out which cards are silly powerful in the real world. 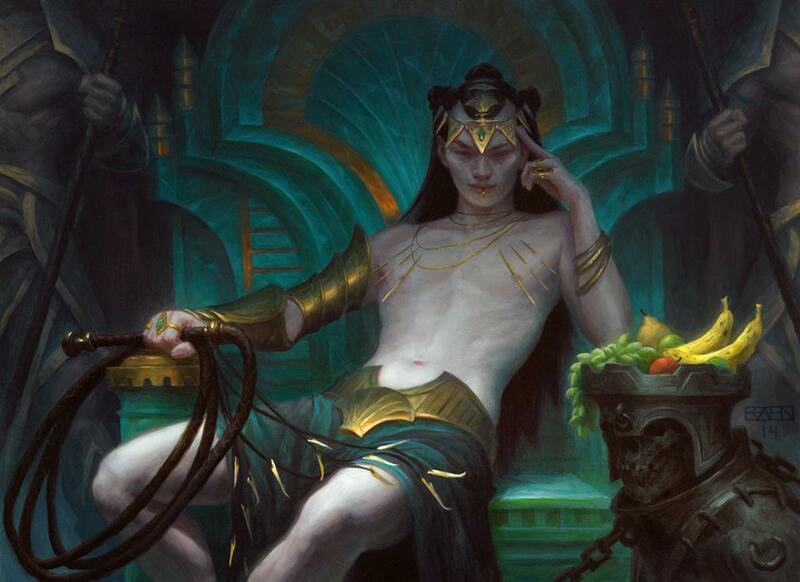 I would only invest in a planeswalker preorder if it was 10 bucks like Khans Sorin. Even if Ob Nix goes to 20 you aren’t getting much bang for your buck. You would do much better finding the 1-2 dollar rare that will blow up to 10. Much more opportunity for investment. If you want to play with OB 15 is perfect. I think Ob Nix will be powerful. I also think he will be $7-10 two months after the prerelease. There is truly only so much EV to go around. For your mythic to be and stay a $15 card, 5 other mythics needs to be $1 or less. and that’s presuming all of the remainder of the mythics will average out at $3. Of the 5 mythics spoiled so far, there isnt a single dollar card amongst them (Greenwarden MAYBE if enough packs are cracked and he cant find a home in standard). So for your prediction to be true, you better hope 5 terrible mythics are spoiled. 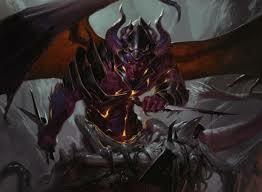 So my question is – why are you so categoric towards the newly spoiled cards, like Ob Nixilis, for instance? Should it fit in any abstract Abzan deck and it may find itself at a much higher price range, not lower. Why not? Or this pessimistic lable is explained by the expectation of the extraordinary amount of packs to be opened, making the supply of the set too extensive? I see what you are saying about Sword of the Animist and Animist’s Awakening but the fact that you didn’t know that Hardened Scales was one of the BEST casual pickups for months now makes me weary of taking your advice. Sword of the Animist and Animist’s Awakening have the same qualities. Casuals and EDH players will buy these cards regardless of their standard play. They have pure upside if they spike because of Standard. 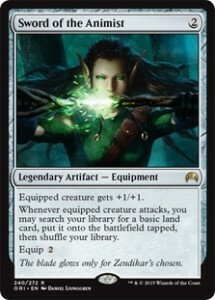 Instead of speculating on Dragon Whisperer… Why don’t you have another look at the supply of Hardened Scales and REALLY consider what this card could be worth a year from now. Why don’t you talk to some EDH players to gauge cards that you aren’t confident in. Just because you don’t like it doesn’t mean its not selling like crazy. Um… Animist’s Awakening will get you those two or three more landfall triggers and hopefully some fetchlands… ON THE SAME TURN YOU CAST IT! With spell mastery you have mana up to cast that ramp spell ON THE SAME TURN too. Are you seriously suggesting that you take 3 extra turns instead of just knocking it out of the park in 1 turn with Animist’s Awakening? Plus… You do realize that Animist’s Awakening will STILL be a spec target when Oath of the Gatewatch spoilers start rolling in. AND it will still be popular in EDH… AND it will have less supply at that point… The play was to get these under $1 and ride the wave. Bail whenever you want to but I’m still confident!!! You seem to be bitter as well with people disagreeing. I too hope Hardened Scales will be a force to reckon with and have brewed with it a lot recently (it’s awesome with Servant of the Scale and Avatar of the Resolute! Oh and HBW and Managorger Hydra), but we’ll have to wait and see how the meta will look like post rotation (because the match-ups right now are pretty bad with all this exile stuff… That being said: Abzan Charm). Animists Awakening is a joke. Really. Go ahead and try it. No, really, don’t just say it, proxy up the deck of your dreams and give it a go. You may come to the same conclusion. This is an EDH card and nothing more. “I tap out turn 8 to get sooo many landfall-triggers!” -“Okay, bro, I Abzan Charm/Valorous Stance your dude/Clash of Wills for 1/kill you 3 turns earlier” or whatever, but hey, you now have 3 more (probably tapped) lands in play! You can’t really fault financiers missing out on Den Protector and Deathmist Raport. The latter was a $5 preorder for a very brief time. I got my playset for $14.25/piece two days before the set release, but I did that so I could jam it in G/W Devotion (insane synergy with whisperwood), not because I thought every deck with G would run the thing. It was over $20/piece shortly thereafter. As for Den Protector, I’m sure some made out like bandits buying in at $2 and selling out at $10 (I got 3 copies at $2 and 1 at $5, once again to play in G/W Devotion). Go back and look at pro tour coverage – almost everyone mis-evaluated Maternal Witness and many of them were vocal about it (Craig Wescoe being one of the only exceptions). That’s about where it stops. The financiers were right about Shaman and See the Unwritten. Ever since BFZ was announced it has been a no-brain pickup. I recall the same being true for Collected Company since it was a $5 for quite a while. Evolutionary Leap also fits in that category; all it needs is the right competitive shell and it’s a $10 card. Speculators are wrong all the time and we shouldn’t fault them for that. It’s all educated guesswork (unless some of them are adept with crystal balls). I can’t speak for DJ but a few things I noticed reading comments and some of my opinions. 1. He did say he was 20 y.o. and might be too young for cards like Doubling Season to impact his financial opinion, so everyone arguing that he’s misevaluating the appeal of Hardened Scales probably have a point. Other writers on this site upon Hardened Scales release said it was a good long term pick up for casual and EDH reasons. 2. For everyone talking about the price of the walkers and price of BFZ cards in general, every expert and Magic player is assuming BFZ is going to be the new most opened set of all time thanks to the Expedition lands…and they are probably right. Now compare the Mythics of BFZ to the Mythics in Khans and you have a similar comparison of what you can expect prices to be for the newer cards. NONE of the Khans Mythics are $15, no rare (Siege Rhino, Dig) is $8 unless it is an eternally playable and valuable fetch land. Financially speaking I think Khans pricing is a phenomenal comparison for what you can expect BFZ cards to be worth. If you don’t like that comparison use Theros as your basis for comparison. 3. I can’t speak to Zada’s EDH value but in Standard he’s not what a red aggro deck wants to be doing on turn 4. Most red aggro decks don’t want to get to 4 mana and sometimes that spot is for 2 Outpost Sieges; you are playing your Titan’s strength on turn 2 on your Swiftspear for 5 damage, not waiting until turn 5. 4. In a vacuum Undergrowth Champion is a good aggressive card that can probably be a turn 5 win if unchecked…but in this Standard when is he going unchecked or unblocked? He’s NOT as fast and powerful as Rabblemaster, a turn 2 Hangarback gets 2-3 blocks in vs Undergrowth, and the Green 3 drop spot is cluttered with Anafenza, Deathmist Raptor, Nissa, Morphed Den Protectors, Managorger Hydra, and Abzan Charm. Worst thing for him is he can be chump blocked for days. Ironically, the same cards that make Zada great (titan’s strength and temur battle rage) can lead to some blow outs with Undergrowth so maybe R/G aggro for them, but I don’t much like him and I do appreciate aggressive red and green cards. 5. Lastly, I remember preordering Khans Sorins for $10-12 and then flipping him right away for $20+. If you really think Ob Nix or Kiora (much less likely) have the same potential go for it. Ob Nix can fill a need in Abzan so it’s not a bad spec or buy at $15 or less if you need him for a deck. But as a 5 drop there’s only so many that can go into a deck’s 75 slots and unlike most walkers he can’t realistically win you the game or lock out your opponent.